Within the past month, both the National Capital Planning Commission and the U.S. Commission of Fine Arts have approved the final version of the Monumental Core Framework Plan: Connecting New Destinations with the National Mall. The goal of the framework plan is to revitalize federal areas adjacent to the National Mall in order to better connect the Mall with the city and waterfront. These areas include the SW Rectangle, East Potomac Park, NW Rectangle, and Federal Triangle. Back in August, Southwest...TLQTC did a post describing the SW Rectangle portion of the draft plan. Not much has changed in the final version, but it appears that the infill opportunities near the Capitol and along the Center Leg Freeway (I-395) were dropped from the plan. Those areas are covered in a separate plan called House Office Buildings Facilities Plan and Preliminary South Capitol Area Plan. 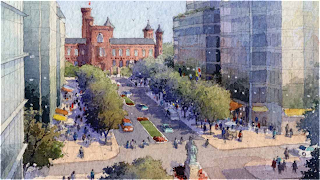 The framework plan calls for several improvements in the SW Rectangle, the most significant being the transformation of 10th Street into a gateway between the National Mall and the Southwest Waterfront. Currently, 10th Street is too wide, uninviting, and at its northern edge, the Department of Energy’s Forrestal Building complex straddles the street, blocking the view of the Smithsonian Castle. At the southern edge of 10th Street, Banneker Overlook is an underutilized asset that offers spectacular views of the Washington Channel and East Potomac Park, but access to the waterfront is limited. Starting from the north, the framework plan calls for narrowing 10th Street and redeveloping the 20-acre Forrestal Building complex as federal office space, with ground floor retail, cultural space, and gardens. The plan calls for temporarily moving DOE from the Forrestal complex to another highly visible site within the monumental core. In order to get the ball rolling quickly…the wrecking ball, that is…my idea would be to move most of DOE to Constitution Center at 7th & D Street while the Forrestal complex is redeveloped. Constitution Center has over 1.3 million vacant SF of newly renovated space in a secure environment, right on top of the L’Enfant Plaza Metro, and it’s aiming for LEED-Gold certification. Sounds like a good temporary fix to me! Here is a rendering of what the 10th Street corridor and the redeveloped Forrestal complex could look like, from the Monumental Core Framework Plan. In the background is the Smithsonian Castle. 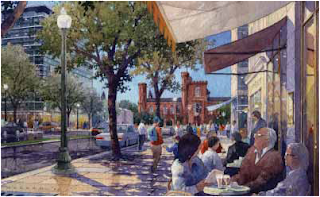 Above is a rendering of street-level retail that could be developed along 10th Street at the Forrestal complex, from the Monumental Core Framework Plan. At the southern end of 10th Street, Banneker Overlook could support a cultural institution or major memorial. A water feature of some sort would remain and a grand staircase would lead down to the Southwest Waterfront, where PN Hoffman and Struever Brothers have big plans of their own. 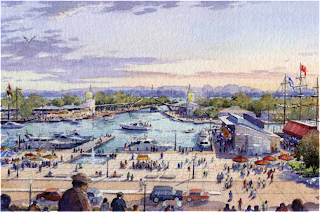 Above is a rendering of the vista of the Southwest Waterfront from Banneker Overlook, from the Monumental Core Framework Plan. Other aspects of the framework plan call for restoring Maryland Avenue as a grand boulevard in the same vein as its sister street – Pennsylvania Avenue, as well as reconnecting streets by decking over freeways and rail tracks that cut through the neighborhood. However, the 10th Street transformation is seen as a top priority. In today's Washington Business Journal, it was reported that the Federal City Council, a group of influential city leaders, has thrown their weight behind the 10th Street plan and have called it a priority for connecting the National Mall with the SW Waterfront. The next step, according to the Council, would be to do a feasibility study of the 10th Street corridor.